I presented in 2017 at the World First Nations Traditional Knowledge Conference, Goothala Doyle, Dreamtime Healer, Actor, Traditional Craftsman/Artisan, Cultural Educator and Activist. Goothala Doyle’s Country and Peoples Yuggurabul The head of the snake sits at the mouth of the Brisbane river with its fork tongue reaching to the two Islands Straddie and Moreton the shared boundaries are south of the Caboolture river and north of the Logan river and go back to the Toowoomba Range, then Yarrawa language groups are between Toowoomba and flows out to past Dalby towards Chinchilla and north to and including some parts of the Bunya Mountains towards Kingaroy, Mothers side Wakka Wakka continues towards Theadore and turns into Wolli Wolli and stops at Theadore creek Back to Fathers side Iman starts at Theadore and goes out to Canarvan Gorge then Tails off to the Yumba at Mitchell, Goongarrie country. Goothala was first recognised as the first Aboriginal person to successfully sue the Queensland police department in the 80s. He attended the Aboriginal and Islander Dance Theatre in Glebe, Sydney NSW, it became NAISDA before he left and Bangarra was being birthed around the time that he left by the 3 Page brothers Goothala married a beautiful intelligent woman of the Wik peoples of western Cape York and they share 3 beautiful intelligent girls, now women. He was chosen to represent Australia and protest against the French nuclear testing in the south pacific with the Bodyshop when it was still owned by an amazing woman and alongside representatives of First Nations peoples of the South Pacific. He travelled to Canada for the First Nations Round Table Festival in Vancouver. Goothala has worked at a grassroots level in the Aboriginal Communities of Napranum and Aurukun communities both before and when the CDEP work for the dole program came in. He has worked in many roles from Homeland Movement to Community Place Officer. He also worked for mining companies from regeneration to loading ships and was present during John Howards 10 point plan to the signing of the Wik agreement. He also took a group of dancers to the Laura Dance and Cultural Festival mostly elders in the true sense of the word and they got first prize that year. He also took the Aurukun community to a footy festival that they also got first prize. Goothala worked as a Youth Officer and then Community Partnerships Officer for Education Queensland delivering Yarning Circle created by Debra Bennett. Cultural frameworks He was also involved in training facilitators in the Yarning Circle and in delivering the Hidden History as part of embedding Aboriginal and Torres Strait Islander perspectives into the curriculum process. Goothala has been an Actor and has acted in a few movies. A couple of these movies are ‘Dead Creek’ by Benjamin Southwell and Eagle Hawk by Bryan Nason. He lives a semi traditional life and has had a no fixed address for many years even when being enslaved in the systems of government and industry. He has had no fixed address and worked for education environment centres conducted weaving, didgeridoo, bushtukka and medicine walks and talks on country. Goothala currently delivers authentic Cultural Education Circles, first under the Nature Yarn elements circles and now Spirit Circles Ancient Wisdom. His work encompasses cultural processes, practices and spirituality teaching and or guiding many to live beyond all religions and much more to be there authentic selves. 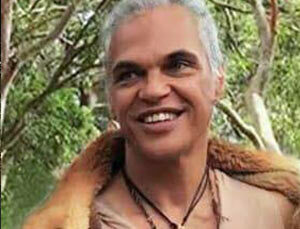 In Goothala’s words, “some say I teach them to be Aboriginal to themselves and I teach all people of all Nations”. ” I also do Dreamtime Healer using Holographic Kinetics created by Steve Richards. In recent events Goothala performed didgeridoo at the Commonwealth Games and have continued to perform at the Woodford Festival every year for the sacred heart union labrith. Goothala is also presenting at the Family Constilations Intensive held in Sydney every year.